A UK fund, called New Pistoia Income Ltd has this morning announced an increase to above 4% in Indigovision (LON:IND). So what, you may ask? What intrigues me is that this is a former >3% shareholder in the company, which sold out in Dec 2011. So here they are, as a fund that knows IND well, buying back in. Therefore it seems to suggest that New Pistioia share my belief that the turnaround strategy of the new CEO at IND is credible, and stands a good chance of delivering very much better performance this year & next year. As I've mentioned before, the main risk with IND currently is that they need to achieve an H2 (6m to 31 Jul 2013) of more than double H1 in EPS terms, in order to achieve forecast full year EPS of 32.7p. Management are upbeat about the prospects for H2, due to projects in the pipeline, and new product launches, but I can understand some investors wanting to see the figures in the bag before relying on them. Of course the shares will be a good bit higher if you do wait for confirmation, so personally I'm anticipating success, & hoping for the best. Investing is ultimately about backing management, and I don't recall seeing a more intensely focussed CEO than IND's, who is really leading from the front to improve the company's performance in many areas. That has to deliver better figures at some point. Results for the year ended 31 Dec 2012 from Globo (LON:GBO) look very impressive on the face of it. Turnover (from continuining operations) up 67%to E46m, EBITDA up 42% to E24m, and profit before tax up 43% to E17.2m. As mentioned before, this company uses aggressive accounting policies, including capitalising a large amount of development spending each year. So when you look at the cashflow statement, it shows a very different picture. Net cash from operating activites was E13.2m, but E11.6m was spent on purchases of tangible & intangible assets - in previous years this has been overwhelmingly capitalised development spending, which are internal costs, so arguably should really be fully expensed through the P&L each year. I'm still not quite sure about the capitalization of software development costs. If a company were to build a widget manufacturing machine, which they could then use to manufacture and sell widgets profitably, then it would seem fair to represent this machine as an asset on the balance sheet. Why is software different? If a company spends money building a great bit of software they can sell over the next few years- is that not an asset too? I'm reasonably comfortable about the intangibles in Globo's case, as they're now getting to the point where the intagibles section of the balance sheet is not growing rapidly (they created 11 million of intangibles, but also wrote off 9 million). Sales to intangibles ratio (which should give a feel for if these are productive assets) is 2.76 in these results, as opposed to 2.25 (including discontinued) or 1.35 (continuing operations) in 2011. In other words, the sales to intangibles ratio is growing, which means each pound of intangibles on the balance sheet is producing more sales than it was last year. Just to clarify about Tesco, I think their total bill including previous investment may well result in a £1billion loss on their US adventure. Exit costs from the US may well run to a couple of hundred million from here, but that's part of the £billion lost. Big money, but when you consider the company makes almost £4billion a year pre tax profits, it was a gamble for them worth having a shot at. Tesco are very successful in other parts of the world, but they joined the graveyard of many British companies trying to break into the US. I think the city will be happy once they announce their exit plan policy and despite the loss it explains a little why Tesco's share price has been recovering the last 3-6 months since they made the announcement that it was under review. Thanks for your thoughts on Globo. Points noted. My feeling with software is that generally speaking development spend should be expensed through the P&L, because it is ongoing, rather than project-based for most software companies - i.e. they need to keep spending a certain amount on development, just to stand still. Also, the pace of obsolescence is so rapid now (especially with mobile apps) that what's hot today could be old hat in 1-2 years. I much prefer the more prudent approach companies like Indigovision (LON:IND) take, of expensing all R&D each year, and showing it as a separate line on the P&L. Globo's cashflow statement concerns me the most - where are all the profits? They just seem to disappear by the time you get to cashflow, which is a big potential warning sign in my view. It might all turn out to be fine, but cash is king in my book, and bigger profits ending up with larger & larger debtors, combined with repeated equity fundraisings, all makes me uncomfortable. Hi Paul - re. Globo (LON:GBO) its definitely worth investors doing some duedil on earnings quality. Obviously our earnings quality filters like the M-Score are algorithmic/mechanical but statistically these things have been shown to work across portfolios. Of course with growth stocks like this a lot of people forgive a lack of cashflow as the company is investing for growth but red flags like these always worry me personally. Investing is a game of odds - I've been burnt so many times believing the dream in small caps where the story looked great but the numbers didn't quite stack up that I've learnt place my bets carefully. PRINCIPLE OF UNIVERSALITY, Charles Scribner's Sons, New York, 1989, pp33-4)." There are a number of reasons (none individually significant) why Tesco (LON:TSCO) failed in US. - unless you are within 15 miles of a top 20 metro in the US, buying in bulk is built into the consumer psyche. What are those room size fridges for then!? Hope you don't mind me mentioning a distinctly non-microcap on this thread. I attended Amec (LON:AMEC) 's AGM last Thursday and have posted a 5 page report on ShareSoc's member network*. Interestingly, even though AMEC is a FTSE100 business, there were only around 30 investors present and plenty of opportunity to ask questions and chat informally with directors afterwards, just as with smaller-cap AGMs. Needless to say, I hold AMEC shares. Very shrewd point IMO! When I was looking at GBO I remember trying to do google searches for "bring your own device software" etc and was struck by how a) hard it was to find Globo's products in this sector, despite this being their flagship product they tell investors about and b) how many other big names have BYOD packages - do you really want to be competing with Cisco in selling enterprise software? (As an aside, I'm surprised more investors don't do this kind of Peter Lynch style customer-level research. It would have kept them all out of Cupid PLC for one!) This combined with the aggressive financial accounting has kept me away - P/Es are meaningless here for valuation and something like the P/S ratio is probably better. "It's only when the tide goes out that you find out who's been swimming naked". I do thoroughly believe that much enterprise software is going to be eaten by a trend that is known as the 'consumerisation of IT' - try a google search. We use Dropbox, Google Apps, Uservoice and other cloud services for many functions at Stockopedia - sure we are a small company but the trend is plain to me. I don't quite know how Globo fits into this trend. Beyond that I did download their application about 18 months ago from the website and found it didn't work. The company did resolve the issue within a couple of days after I contacted them, but again it made me refrain from purchasing the shares. So today I downloaded the demo app from iTunes again. It's got the basic calendar/task/email apps as well as ERP and CRM stuff. 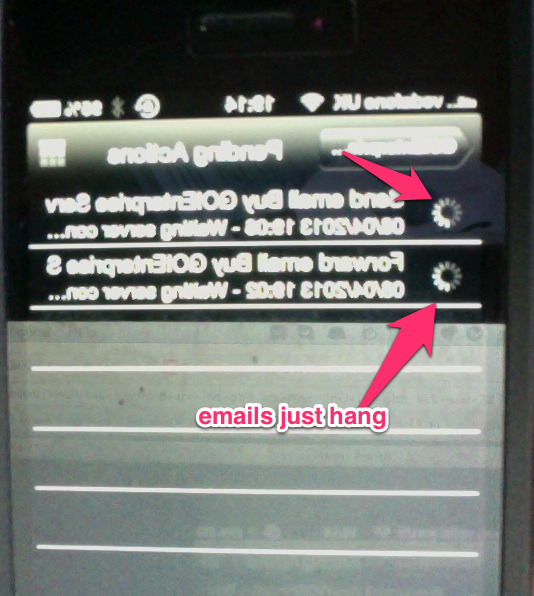 While basic it works ok for the most part - though it crashed when I tried to send my first email. On opening again I tried to forward another email to my own account a couple of times - it couldn't do that either - both emails are just hanging in my pending actions folder (see below). Maybe just something to do with being a demo app? I had a bad experience owning RCG shares (another foreign domiciled AIM tech stock) in 2007 when a facial recognition product I received from the company locked me out of my computer forever - but I was such a believer at the time that I just ignored the red flag - I managed to get out at 65p for a 50% gain but way off the 140p it peaked at - it taught me a big lesson. Regardless, I'm surprised you don't get any sales or marketing materials through by email from Globo, or any sales people checking on you like when you sign up for a cloud enterprise app with most companies. They may want to work on their web based sales and marketing generally. I wonder if anyone has tried using Indigovision products in some Lynch style research? I like the story, but it would be reassuring to know a bit more about their products before increasing my holding. As for Tesco in the USA, well their successful stores in east Europe & Thailand resemble the big sheds they have in the UK. I gather they tried a different business model in the US. So it's yet another British retailer who failed in the US. The nice thing about Indigovision (LON:IND) from an investors perspective, is that there's loads of third party evidence of the product being very good, from the many systems integrators who install it. Also a lot of IND sites are named by IND themselves, with quotes from the end customer about how pleased they are with it. OK, it's easy to get customer quotes - but only if the customer is happy with the product. Also, you can check out the quality of the low bandwidth video yourself, here on Edinburgh Zoo's "panda-cam" supplied by IND! Definitely knowledgeable buying going on!